'Skyward' debuted last month and it was such a pleasant surprise. The world has lost most of its gravity sending countless of people to their deaths as they floated away to space. A scientist father and his baby girl survive and twenty years later the world has adjusted. For Willa, it's the only life she's known but being tethered to her hometown has gotten stale. She wants to travel but her agoraphobic father has other ideas. Joe Henderson's post-apocalyptic fantasy is a joy to read in part because of his protagonist Willa. 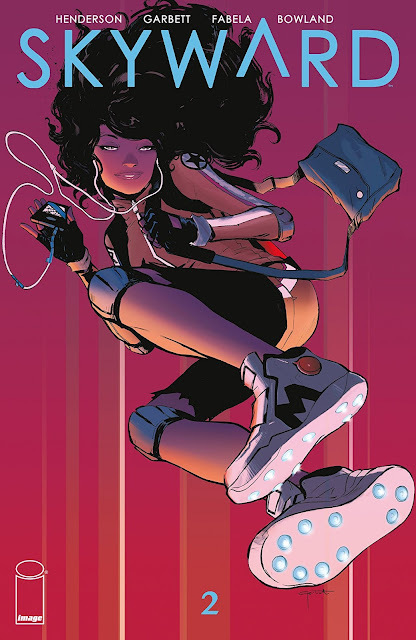 Her joy and enthusiasm are infectious and as beautifully illustrated by Lee Garbett and Antonio Fabela, 'Skyward' is also a visual treat. As light and airy (pun intended) as the first issue was the brilliantly designed opening splash pages of issue two offers a sobering look at the human cost of such a cataclysmic event. It's that traumatic event that haunts Willa's father who hasn't left their apartment in twenty years. He predicted this would happen and thinks he can reverse it but Willa remains unconvinced. However, Willa learns that his scientific partner also predicted this event and has capitalized monetarily greatly from it. She thinks he can help her father so she heads to ground level to seek him out. As reviewers, we also talk about "world-building" and it's part of any comic book especially for sci-fi and fantasy stories. In 'Skyward's case, the world is very similar to our own only tweaked enough to create a totally different dynamic that imagines a low-gravity reality. In doing so, Henderson realistically depicts a class structure that allows the rich to have technology that keeps their feet on the ground while everyone else fends for themselves up in the air. In general, the rich have always had the means to create their own reality away from the tribulations of regular people. This is no different and it makes for an interesting realm for Willa to infiltrate. The best comics reach a certain synchronicity between script and art. Henderson, penciler Lee Garbett, colorist Antonio Fabela, and letterer Simon Bowland are in tune in perfect harmony giving this entertaining fantasy a colorful and effervescent rendering. The way floating is conveyed feels effortless and light as it should, it's not so much as flying but suspending in the air. The character designs are especially engaging and diverse. The colors are rich and striking drawing your eyes into every corner of every panel. Frankly, the art team helps make this comic irresistible. 'Skyward' is so well executed and constructed it's the type of comic you can recommend to anyone and everyone. It's engaging and charming while being mysterious but inviting. There are certain stories tailored to one niche or another but 'Skyward' is truly a title that can be universally consumed and enjoyed. It's only issue two and I'm already smitten with this comic. And you will be too.